The SkyExpedition 76AZ telescope is a great way to open up the wonders of the Universe to the aspiring astronomer. It's lightweight and easy to set up, making it an excellent choice for the beginning astronomer. The SkyExpedition 76AZ telescope is a great way to open up the wonders of the Universe to the aspiring astronomer. 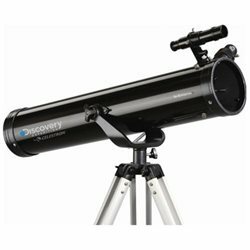 It's lightweight and easy to set up, making it an excellent choice for the beginning astronomer. Features include: 76 mm (3 ) aperture Newtonian telescope Altazimuth mount 20 mm (35x), 4 mm (175x) eyepieces Pre-assembled aluminum tripod Erect images for land and sky viewing Easy to assemble 3x Barlow lens - triples the magnifying power of each eyepiece Dimensions: 27 L x 36 W x 48 H Weight: 11 lbs.